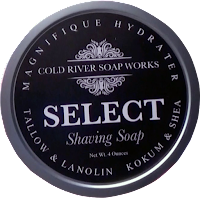 Sometimes you have to talk about presentation first and I’m going to do that with Cold River Soap Works. When they first arrive you’ll notice how each item is carefully packaged. Once removed you are presented with a classic heavy gauge rust resistant tin sporting a very large 4 inch opening for loading your brush. The lid on this tin leaves no doubt that its going to stay on until you decide otherwise. The label is classic black and white and it’s done so well it definitely demands your attention. Included with the soap, a black invitation size envelope sealed with what appears to be a replica of a waxed letter (S) for SELECT. Inside, a card welcoming and thanking you for purchasing Cold River Soap Products. Nice touch. Larry was nice enough to supply me with two tins to try but after glaring at the labels for 20 seconds I released I had to turn the tins over to identify the scent. Also included on the back label are the soap ingredients. I have come across a lot of soaps in the past year but this it the first one that didn’t have the scent right on the front label. The scent on the citrus is just incredible. The profile by CRSW is as follows. Jardin d’Orange Perfect for a hot summer day, this fragrance opens unapologetically with a blast of tart orange and settles quickly into a citrus blend of lemon zest and juicy mandarin. A green accord develops to reveal notes rich with a woodsy earthiness, like a walk through a blossoming orange grove. Personally I will be using this soap all year round. It’s now one of my favorites in my den. My hats off to the Vetiver Moderne a wonderful twist on the Vetiver scent. Here’s the profile on by CRSW. A Vétiver that is perfect for any season. We start with a Haitian Vètiver that imparts a light smoky, earthy note and blends seamlessly with a soft plum and citrus finish. Loading the brush was extremely easy due to the tins wide opening. Just a little water on the brush and a splash in the tin was all that was needed and as a bonus I noticed an increased in scent as well. When face lathering you get a very thick, rich, creamy lather with the slickness and glide that will last your entire shave. I was able to go over ruff spots on my face without worry and extra lather. For people who do two to three passes you would have more than enough with just one load of the brush. The post shave feel was great as well. To top everything off I finished with the after shave balm of the same scent. I noticed a very slight scent change to a powdery side but it was a great accompaniment and a wonderful finish to a perfect shave. So as you can tell I really like Cold River Soap Works. 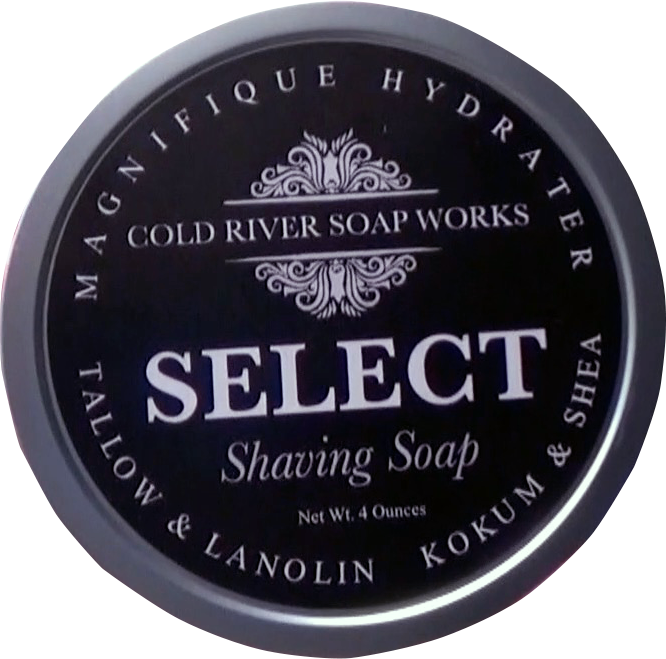 The Select line of soaps and the aftershaves balms are solid performers. The power house of ingredients that makes up the SELECT line is outstanding. I personally like soaps that have lanolin it does such nice things to my skin and I’m sure the added Shea Butter and Kokum in SELECT doesn’t hurt either. Now that you read about it click on the Video.